The World Cup is a time for countries to unite, a time to focus on the spirit of the game and the valiant sportsmanship of the players (ahem). This, it turns out, is not exclusive to humans -- dogs also want play the beautiful game. While we haven't seen them yet at this cup, dogs are no stranger to the pitch, and often show up during the middle of a soccer match -- and become the stars of the team. They have no hands after all, so there's a clear advantage. 1. Two cute pups steal the show. 2. A speedy sprinter can't be caught. 3. A playful mutt won't share the ball. 4. A dog leaves.... his mark on the field. 5. Even the goalie can't catch this pup. 6. A heroic ball boy saves a dog from an angry player. 7. 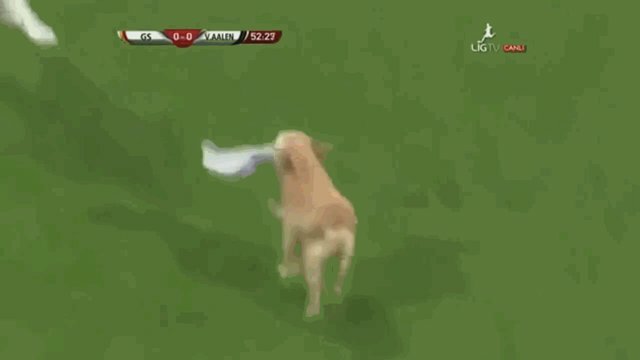 A cute puppy gets a lift off the field.